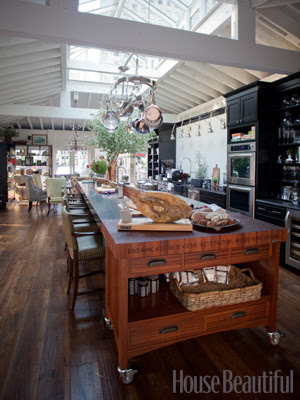 It's always fun to see House Beautiful's Kitchen of the Year. 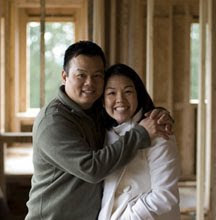 Last year, I wrote about the kitchen Ina Garten designed in 2009. I remember being in Rockefeller Center one year when they were setting it all up. So fun. NYC is the best! 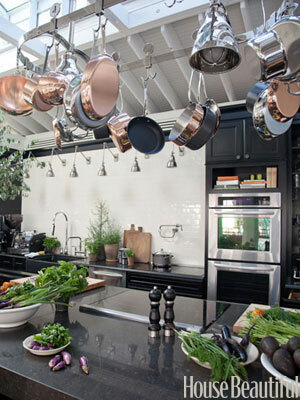 Here are some things that I love about this year's kitchen designed by Tyler Florence. Texture and Color. I love the idea of using a different material for your island. Butcher block works perfectly. It's warm, feels lived in and can go modern or traditonal. This island is awesome. So practical with the storage and all the drawers, rolls and fits perfectly. Contrast. LOVING the contrast of light dark. Never can go wrong with subway tile and the dark cabinetry set against the white backsplach and beams is striking. A side office in the kitchen is so practical. What I love about this one is that it has doors that can actually close! 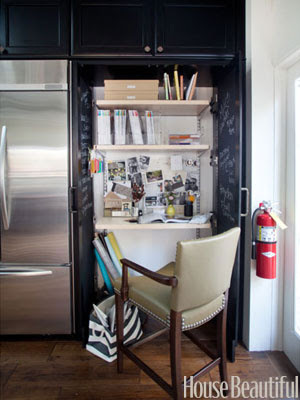 And the chalkboard paint on the inside is genius! Bold. The dark cabinetry in here is really stunning. 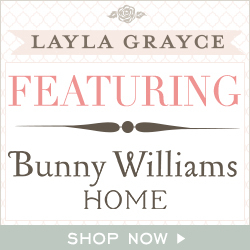 Look how the white dishware pops! I don't know if I'd be brave enough to go black, but I'm all for gray. 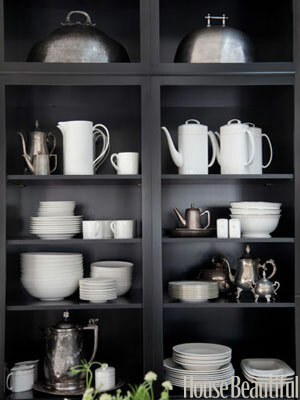 If I ever paint my white cabinets, I'm going for a dark gray. A twist on a classic. A black cast iron sink. 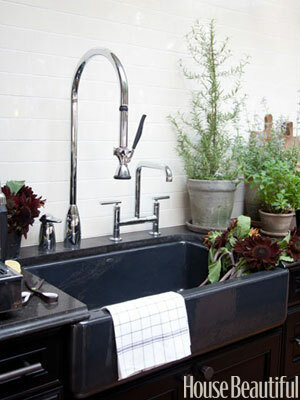 Love the gooseneck faucet, beautiful and practical. Don't you love the mismatched chairs. Gorgeous use of coordinating fabrics. It makes the room not so "put together" and so welcoming. 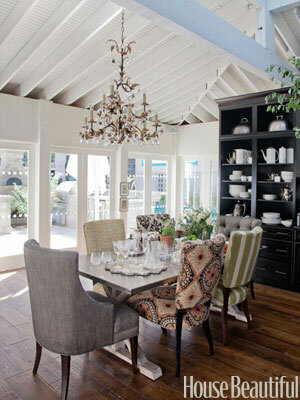 A great look and easily acheived on a budget by getting mismatched chairs and reupholstering. This may be may favorite photo of the bunch. 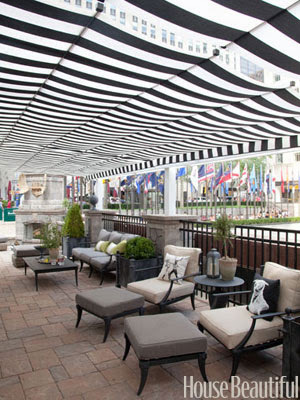 You know my love for stripes and that awning just screams, resort, relax and rest. Retractable shades by Sunbrella. Lastly, I really like the open bookshelves in the space. Airy, open, and casual. 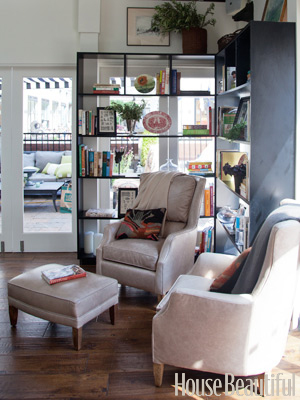 A great option is you have a room full of windows, but need to put up shelving for storage. To see the whole tour, click here.